I don’t remember the last time my stomach dropped while staring at a book display, but it happened a bit over a week ago in a Christian bookstore. This is a rack of thin, kid-friendly Bible stories. Nothing wrong with that, of course, but these publishers have taken things a step further. Rather than just telling kids the stories, they’ve made those famous heroes and heroines into youngsters themselves! I mean, run your eye over these covers. How deeply can you go into the challenges which each of these people faced when they’re depicted as children? (‘Way down at the bottom of the display you’ll see the name “Samuel,” and I suppose he’s the only true child in the group if the story focuses on “Speak, Lord, for thy servant heareth.”) I’m not quite sure what to think about this project. I would imagine that they’ve sanitized the stories pretty well, and have avoided the really traumatic parts. As I say, my stomach dropped a bit when I saw these. And as I say, I’m not exactly sure what to think. 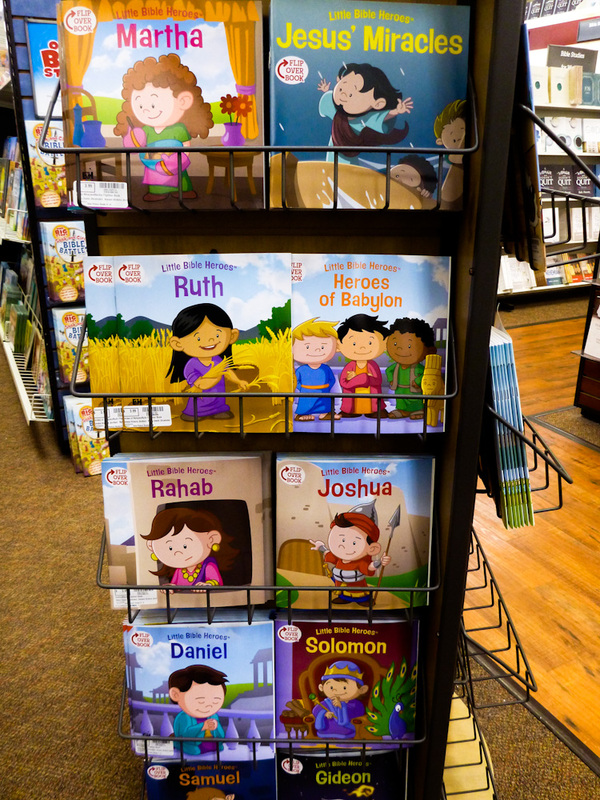 What I hope comes out of these books is that the kids get to feel friendly with these Bible people, friendly enough to start and continue reading about them from the Bible itself. And I hope that, as they grow, these kids are earnestly taught that these Bible people had gritty, grownup faith which helped them meet staggering challenges.